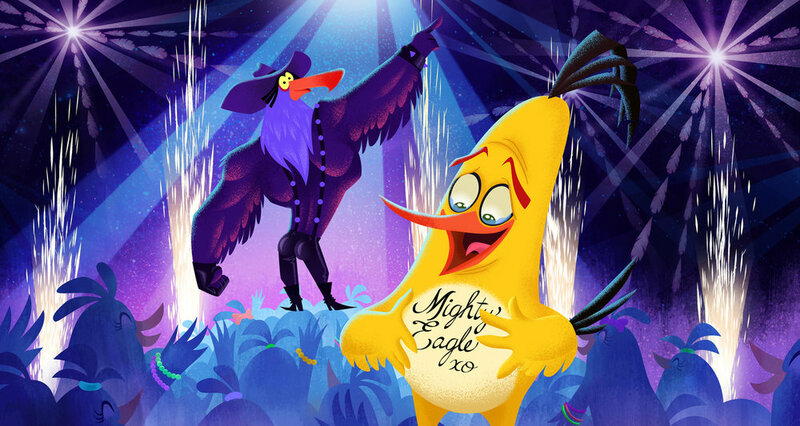 Animation Supervisor for the 2D Mighty Eagle Sequence on The Angry Birds Movie. Directed by Clay Kaytis and Fergal Reilly. I was sent to Finland along with my friend Travis Ruiz (Background Supervisor) to supervised the 2D dream sequence for the movie with the team at Rovio. Character developed by Francesca Natale. This scene was animated by Pinja Partanen. She did an amazing job on this one which has so much stuff going on. Below you will see just some fixes I did on the wings and feathers for Pinja to improve which she did great in the final version of it. The animator Kaisa Pirttinen and myself worked on this scene for a long time. Sadly it was cut out from the final cut of the movie. It was a really challenging and fun scene to have worked on. You can see a clean up version down below with a few breakdowns missing that Kaisa later finished them doing a great job. This scene was a cut in action from Scene 05 also animated by Kaisa Pirttinen and myself. Sadly it was cut from the final cut of the movie as well. You can see a clean up version down below which I sent to Kaisa for the final details she awesomely took care. This scene was a fun one to work on. Animator Sara Wahl and I worked on this scene trying to make work the fact that it is a really quick action and it had to read properly. This scene was hard to get it done because we need it to get Mighty Eagle's expression right to his personality. Animator Pinja Partanen and I work also a lot on the hair. The 2D Mighty Eagle Sequence was made by a great group of people.